EFFector - Volume 26, Issue 14 - Stunned. Angry. Fighting back against NSA spying. In most issues of EFFector, we give an overview of all the work we're doing at EFF right now. This week, we’re taking a deep dive into a single issue: new revelations of a massive domestic surveillance program leaked to the Guardian and Washington Post. Last night, we received confirmation from a report in the Guardian that the National Security Agency (NSA) is currently collecting the call records of every Verizon customer in America. The NSA order forces Verizon to provide "on an ongoing daily basis" all call records for any call "wholly within the United States, including local telephone calls” and any call made "between the United States and abroad." And that’s not all. Today, the Washington Post and the Guardian published reports based on information provided by a career intelligence officer showing how the NSA and the FBI are tapping directly into the central servers of nine leading U.S. Internet companies. The government is extracting audio, video, photographs, e-mails, documents, and connection logs that enable analysts to track a person’s movements and contacts over time. EFF has so much evidence of the surveillance now that we've created a timeline. In brief, America first learned about the secret surveillance in a 2005 New York Times exposé which disclosed one aspect of the NSA’s domestic surveillance program. We learned that the Bush Administration had been illegally tapping phone lines in the U.S. without warrants or court permission immediately following the 9/11 attacks. President Bush himself admitted at least some of what the government was doing. In early 2006, EFF received photos and blueprints from former AT&T technician Mark Klein. These undisputed documents show that AT&T installed a fiberoptic splitter at its facility in San Francisco which sends copies of all AT&T customers’ emails, web browsing, and other Internet traffic to the NSA. Later in 2006, USA Today and a number of other newspapers published a story disclosing that the NSA had compiled a massive database of call records from American telecommunications companies, which included AT&T, Verizon, and Bell South. This was confirmed by a number of members of Congress. Information has continued to trickle out over time. In 2009, the New York Times reported the NSA was still collecting purely domestic communications in a "significant and systematic" way after the FISA Amendments Act was passed in 2008. The news of the last few days has confirmed the records portion of the surveillance, and gave us some additional hints about the government’s arguments in support of its actions. The secret court order issued to Verizon was a Section 215 order (50 U.S.C. sec. 1861), a controversial legal instrument greatly expanded when George Bush signed the USA PATRIOT Act into law on October 26, 2001. It allows the government to seek "any tangible things" in connection with an authorized investigation and is often known as the "business records" provision of FISA. Section 215 allows for secret court orders to records that are "relevant" to a government investigation – a far lower threshold and more expansive reach than a warrant based on probable cause. The list of possible "tangible things" the government can obtain is seemingly limitless, and could include everything from driver’s license records to Internet browsing history. We've long suspected that the government has been using Section 215 to conduct dragnet surveillance. Now we have incontrovertible evidence. 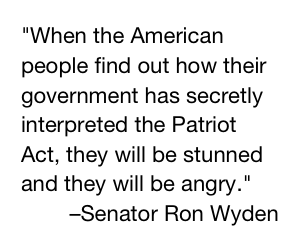 Senator Ron Wyden has warned that "when the American people find out how their government has secretly interpreted the Patriot Act, they will be stunned and they will be angry." First of all, we're leading the charge to stop the NSA’s domestic surveillance program in the courts. Since 2006, EFF has challenged the NSA surveillance in two landmark lawsuits, Hepting v. AT&T and Jewel v. NSA. These cases, in which we represent AT&T customers, include both the wiretapping claims arising from the fiberoptic splitter that Mark Klein found and the scooping up of communications records referred to in the Verizon order. We also have fought back against other PATRIOT Act surveillance abuses, including bringing a case that resulted in National Security Letters being declared unconstitutional -- which is currently on appeal to the Ninth Circuit. We’re also fighting for transparency. In 2011, we filed a FOIA lawsuit against the Department of Justice for records about the government’s secret interpretation of Section 215. Last week we submitted a brief to the secret FISA court itself in that case. And we're pushing for legislative reform. We've organized tens of thousands of concerned citizens to speak out against the surveillance powers in the PATRIOT Act and the FISA Amendments Act, and now we’re calling on the public to demand a full, public accounting of the government's surveillance programs. We're asking individuals to email Congress right away to tell them in the strongest possible terms that you do not consent to dragnet domestic surveillance. 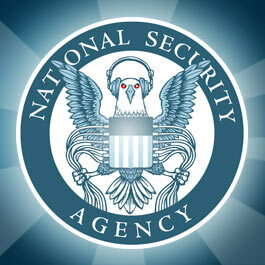 Tell your elected officials that you object to this mass domestic spying program. Demand that they initiate a full-scale, public investigation immediately with the results of the investigation made public as much as possible. Demand that the public officials responsible for this program are held to account. Click here to speak out now. And we’re also asking individuals to support our work. Become an EFF member today and join the fight to defend fundamental liberties in the digital world.